The Athena-H2 is one of the newest, state-of-the-art water ionizers. By internal switching from AC to DC the H2 water ionizer is a powerhouse for the production of H2 antioxidants. This design was specifically developed to achieve the highest levels of H2- Antioxidants (molecular hydrogen) and ORP per unit of pH of any other water ionizer. Read more about the benefits of H2- antioxidants. 5 Alkaline Settings (not just 3 or 4)! All of the 5 alkaline settings produce ionized water which can be consumed! There are no chemicals used to make even the strongest levels of alkaline ionized water in the Athena H2 water ionizer. Note: Always start drinking on the lowest alkaline level and move up to a higher level if or when your body is ready. Powerful Hydrogen Antioxidants Generator: The production of molecular hydrogen, or H2-, requires advanced technology, which the H2 water ionizers have. The Athena H2 water ionizer uses advanced and patented Hydrogen Infusion Technology, which enables optimal levels of molecular hydrogen (H2- Antioxidants). 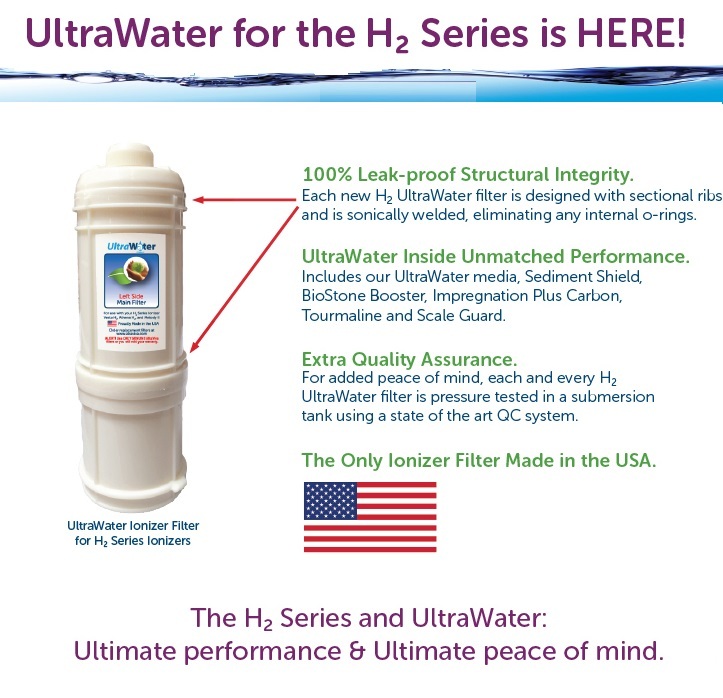 The H2 water ionizers are the only water ionizers to use this technology. Hydrogen Infusion Technology specifically optimizes the infusion of Hydrogen antioxidants into the water and performance of the water ionizer. This technology is very new and unique to the H2 water ionizers. With the Athena H2 water ionizer you get the power of H2- antioxidants with every level of pH you select. Why are H2-antioxidants so important? The tiny size and solubility of H2- antioxidants makes them the only antioxidants capable of passing through cell membranes and the blood-brain barrier. Inside the cell, where free-radicals do the most damage, the power of molecular hydrogen becomes a literal life-saver. Best negative ORP per unit of pH on all alkaline settings! Continuous-Cleaning! Fully automatic continuous-cleaning means that your H2 water ionizer will maintain it's peak performance throughout the life of the water ionizer. Most water ionizers have automatic, but intermittent, cleaning. This could allow for some calcium build-up on the plates because it's intermittent and not continuous. Calcium on the plates makes them less able to ionize at their maximum. It is a scientific principle that platinum catalyzes [speeds up] electrolysis. But, to do that the platinum must be in direct contact with the water. So, even the thinnest film of calcium on the plates can inhibit that water ionizer's potential to ionize fully and efficiently. With the Athena H2 water ionizer the cleaning is automatic, in background, and continuous - 100% of the time. You never have to wait, and your H2 water ionizer always gives you the maximum amount of antioxidants in your water. High Quality, Patented, Ultra-Water Filtration. The Athena H2 Water Ionizer's filtration is going to give you pristine clean water! Real-Time Flow Control: You can set and forget your power setttings and flow-control with the new Athena H2 water ionizer. Ongoing self-diagnosis with a mini-computer on-board! The Micom [miniature computer] System controls every operation of the Jupiter Athena water ionizer to improve performance. 7 high grade, technilogically advanced, platinum coated, titanium plates! The seven, advanced, SmartDesign electrodes are solid plates, but very efficiently created to produce the best ORP per unit of pH of any water ionizer. SmartDesign electrodes used in the Athena H2 are state of the art and super-efficient at all power-levels, even the lowest power-level. After extensive research, the engineers have found the higher the power density used in ionization, the less H2 stays in the water. To get the benefit of H2- it has to be dissolved in the water. In addition to better performance, running lower power puts less stress on the plates, which leads to increased durability over time. SmartDesign electrodes are the most advanced, solid plate design of all water ionizers. They are electro-plated and optimized specifically for efficiency and highest performance. Top Certifications and Outstanding Companies: There aren't better water ionizer companies than these. 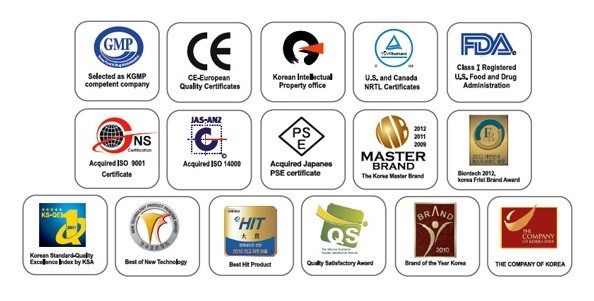 Their certifications are numerous, including ISO 9001 and 14001, UL standard for Low voltage electrical, NRTL, CE and KFDA. The parts are all of a very high quality which should last a lifetime. The warranty offered by AlkaViva covers you if your water ionizer ever has a spontaneous malfunction due to a defective part. Their repair depot is located in Reno, Nevada. In order to assist you to qualify for their lifetime warranty, we at Alkaline Water Plus will register your water ionizer for you. Just email us support@alkalinewaterplus.com with the serial number on the back of your machine when it arrives and we will take care of the rest. Make sure you do this, because the warranty defaults to 1-year if it's not registered within 30 days of purchase, and if this happens it could void your 60-day trial with us. Read more about the AlkaViva Lifetime Parts & 5-Year Labor Warranty. All AlkaViva water ionizers are tested before leaving the AlkaViva warehouse (without using the filters) and Emco Tech factory for quality control purposes. There is usually a small amount of residual water, so plugs are placed on all water ionizer ports for shipping. Please follow these guidelines for removing the quick-connect plugs. Comes With Installation Accessories including hosing, pH test kit, lever-style diverter for faucet connection and John Guest Tee for direct plumbing connection. Protection Mechanisms: 2 temperature sensors built-in and fuse to protect machine from overloads. Flow-Rate: 1.5 liters/min. to 2.5 liters/min. Mineral Port: Yes, in each filter.